Da Hip Hop Witch is an ineptly made horror film that can't even live up to it's modest premise of being a rap themed knockoff of the Blair Witch Project. The plot, if there can be said to be one, centers around 5 suburban White kids and an intrepid (Black, female) reporter who all attempt to locate 'Da Hip Hop Witch' in New York City. Da Witch has been attacking famous rap artists, and a bounty is offered for her capture (or something). One would never be able to tell characters were the leads, if not for the appearance of a title card at the beginning of the film. While their plot threads are indeed represented, most of the film is spent depicting footage from Da Hip Hop Witch TV Network, which features name-brand rappers ad-libbing about their encounters with the witch and broadcasts 24/7. There are also subplots involving a rapper signing a shady record deal and an intellectually disabled man who rides a bicycle. At the only 3 minute mark, it becomes obvious this is one of the worst films ever made. Thanks to the appearance of a dozen or so rappers, the cast list looks like something out of Dostoyevsky, though only one of them really has an impact on the story. Until the final 30 minutes or so, most of the film is comprised of pointless exposition and rappers feigning fright on Hip Hop Witch TV. Incomprehensible can't even begin to describe the way all of the film's threads are cut together. So much so, the film might as well have been created using the cut-up technique and passed off as avant garde performance art. On paper, a rap themed Blair Witch Project doesn't seem like the worst idea to turn a few bucks on the straight-to-video market. 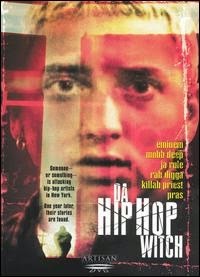 Director, writer and star Dale Resteghini's prolific career in music videos helps explain the appearance of so many recognizable rap stars (Eminem, Ja Rule, Vanilla Ice), but it's unfortunate that he can't translate his experience (and Rolodex) into a coherent narrative. In fact, it's an utter failure as a horror film. There is no tension, no atmosphere, squandered chances for metaphors and not even any gore for the gore hounds. The Witch always appears off camera, leading to a pointless subplot about whether or not she's even real. It's even unclear what format this film was shot on. Though IMDb credits the film to digital video, it looks as if it was mastered on VHS. Whether a VHS rip somehow made it to Netflix Instant or the film was designed to look "intentionally bad," it is a point lost to this reviewer. Blurry, shaky and out of focus, the filmmakers have exceeded all expectations if they opted for the latter. It's vaguely found footage affair, though that angle isn't strictly followed. Sound and dialog appears to have been recorded using the camera's shotgun mic,which only adds to the film's classy production value. It has all of the hallmarks of teenagers who got their hands on a video camera but not a screenwriting or editing book.